This is a commission that I recently completed of two dogs. The final drawing is about 11 X 14. I did this on hot press watercolor paper and used a mechanical pencil. I found that I worked slowly in layers of graphite, first with a rough sketch and then making sure I got the eyes and features correct before filling in the detail of the fur. I blended as I went using the pencil, rather than a blending stomp or other tool. 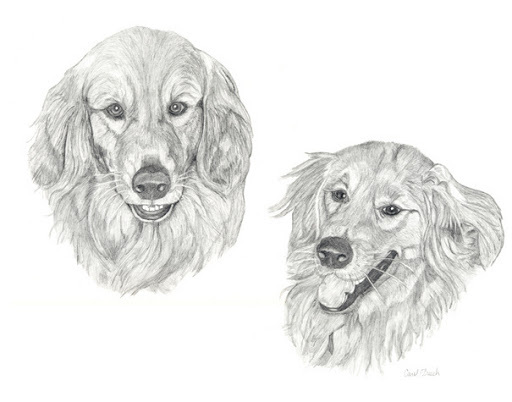 I think that the final version looks ‘rougher’ to me than other graphite pet portraits I have seen, but in the end, I really like the effect and think that both dogs turned out very well. They are really lovely Carol. Great detail and I am sure the owner loves your potraits. I often use a mechanical pencil, always a nice sharp point. p.s. Forget to say thank you for your comments, and I can see I have missed the r out of portrait! Thanks, Milly! Yes, I really like the control of a mechanical pencil. I can see how you would enjoy that in your work, also.